The Transformers universe seems to have really geared up in the past few years, thanks in large part to the high profile and high budget feature films that will soon be rounded out as a trilogy. Whatever your opinion of the new films may be, it has introduced a long standing genre to a new generation of fans, and although I still count the original TV series as my personal favorite, I think much of that is due to the rose colored glasses of nostalgia rather than an overarching display of quality. Whether you are a new fan or old, though, here are some items that any fan of the genre can enjoy. The new movies really enamored fans with the formerly low profile bumblebee. He may not be the most powerful autobot around, but no one can question his comittment to the cause and unwavering enthusiasm. 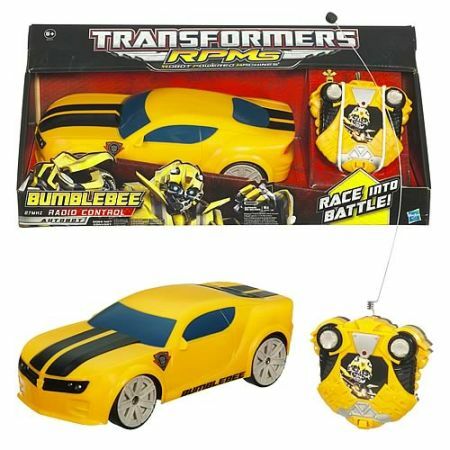 This Bumblebee remote controlled car shows off all of his best qualities. He is also generally in a good mood on most days, and I can appreciate the optimism. Take all of those positive qualities and squish them into a nicely compact remote controlled vehicle, and you have the makings of a truly great toy. Now you, too, can tool around with Bumblebee’s updated exterior. If you are looking for a way to show off your Transformers Fandom, you can’t find a better vehicle for it than attaching the Autobot logo to something you’ll use just about every day of your life. 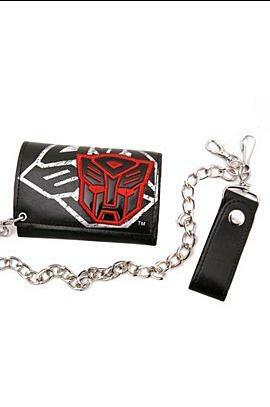 This Transformers chain wallet fits that niche nicely. 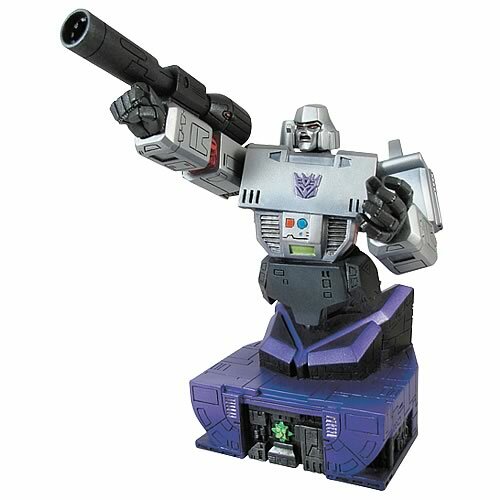 If you are one of those people that tends to root for the bad guy in a movie, you do have the option of going with a Decepticon wallet as well. Both of them are well constructed and have room for all of your wallet-related needs such as a handy place to store your photo id. 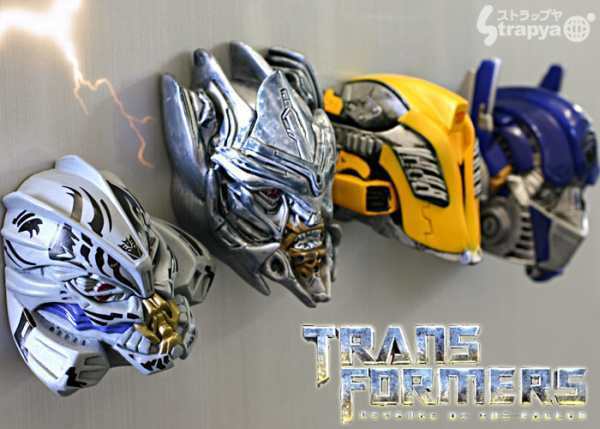 I’m not sure why exactly you would want to have Megatron’s ugly mug staring at you in disdain each morning as you grab your milk out of the fridge, but just in case, someone has created these Transformers 3D magnets, featuring a variety of characters from the new set of movies. Personally I think Bumblebee would make the most sense, since he’s a pretty peppy guy and you need a pick me up for those grueling Monday mornings, am I right? If you are a serious fan of any particular character, genre, or series, than it seems to be a rite of passage to pick up an expensive bust of your favorite character to show off just how deep your fandom rabbit hole goes. In that vein, I can present to you this Transformers Megatron Bust. Iti s good to see some old school representation here, even if it isn’t quite as flashy or explosive as the new Megatron is in the Michael Bay movies. Most busts are professionally detailed and very expensive, but this one is very reasonable. The transformers haven’t been known for their ability to solve problems diplomatically, and generally encounters devolve into a flurry of lasers, rockets, and electronic fists in short order. 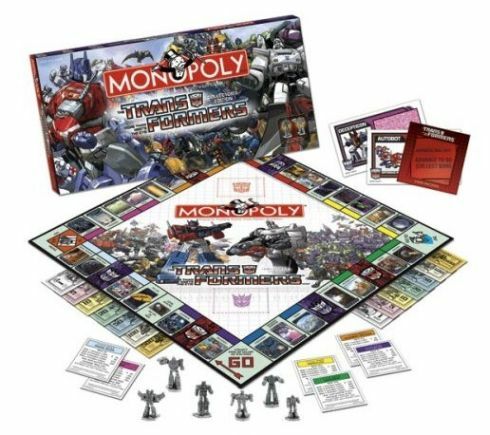 The Transformers Monopoly game, however, is a game of finance, and you can control Optimus Prime, Megatron, Bumblebee, Soundwave, Jazz, and Starscream in a bid to cursh your opponents from a financial perspective. Fight for all of the important sections of the Transformers universe in a classic board game reboot. I suppose a three hour cinematic epic of Megatron getting bankrupted by Optimus Prime’s line of luxury hotels wouldn’t make for a very compelling movie, but the imagery sure is hilarious. I’d imagine everyone would want to be Optimus Prime or Megatron in the game, but personally I’ll be picking up Bumblebee for my game piece. The board does a great job of integrating everything you love about the Transformers univserse, and although the premise doesn’t really make sense since they would just annihilate the hotel on boardwalk rather than pay to stay there, it will undoubtedly provide hours of fun for the whole family. I’d like to see an old school version as well, but you can’t always get what you want.